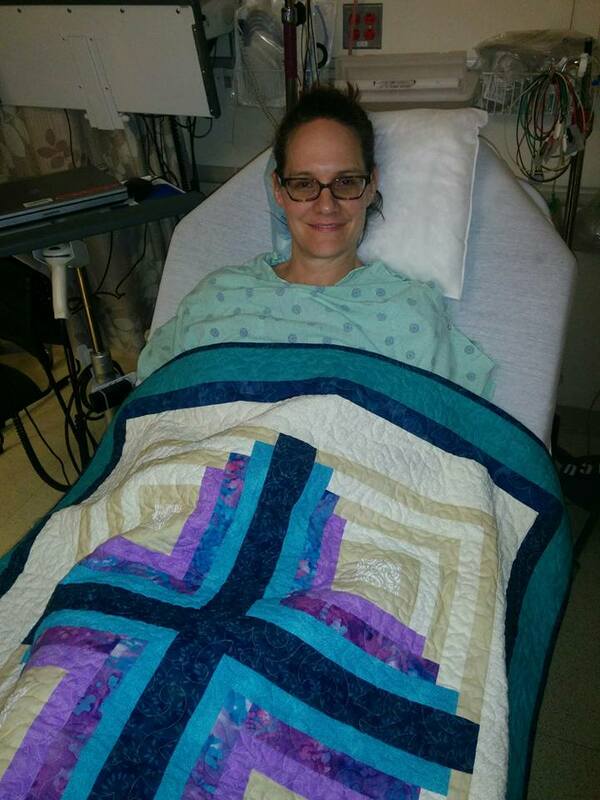 September 3, 2015: The morning of my double mastectomy and immediate reconstruction. Found wonderful comfort and warmth under this beautiful quilt my dear church made me. I have had a mean case of writer’s block. I mean the can’t-even-open-my-computer kind of writer’s block. I hadn’t planned on that happening! I guess I shouldn’t be surprised that breast cancer surgery and recovery might drain a bit of my creativity…..duh. But I had plans of blogging and reflecting on the journey as I traveled it. But my creativity and inspiration left me the week before surgery. Suddenly, I had no energy to write. I had no energy for phone calls or email. I had no energy. I turned into a lump in my easy chair, crocheting and watching Grey’s Anatomy. You can throw in a little Spider Solitaire as well. I. Am. A. LUMP. That means I had no energy for prayer either. Still don’t have much energy and it is kinda sad. Writing and prayer go hand in hand with me. Crafting sermons, researching the bible passages, creating meaningful worship, and prayer are the backbone of my spiritual life. But Grey’s Anatomy and prayer. No way. No how. Being a lump and prayer don’t do so well either. I know people who go through times like this with great intentionality. I know people who meditate and journal and reflect and find closeness to God. Not me. I suffer from lump-atitis. That’s me, a big lump with breast cancer. I have not experienced any “thin places” in the last three weeks. I haven’t found the Spirit in the midst of my brokenness. But I know a ton about Dr. McDreamy and Dr. Bailey and Shonda Rhimes’ work, which means I am desperately waiting for Scandal and How to Get Away With Murder to start up again this fall. So instead of writing and praying and communing with God, this is what I have been up to–nurturing my inner lump. And I am trying to be okay with that. I have to trust that prayer will come back to me. I have to trust that I have a future filled with bible study and sermon prep and creating meaningful worship. I have to trust that this is just a pause in my life. What gets me through each day as a lump is knowing that I am surrounded by people praying for me, people close to me and people far, far away. People I know well and people I have never met. My friends, my family, my colleagues, my congregations. I feel your prayers. Thank you for taking up that mantle. Thank you for your faithfulness in the midst of my lump-hood. Just when you can’t stand it another minute your energy will come back….really! I trust that you know what you are talking about, Rebecca. Love to you! I love that! Thanks, Cindy! I love you so much. Sitting with the lump is okay and you will in your own time realize that God and the Holy Spirit have been with you the entire time, even though you were unaware. Others are surrounding you in prayer and love. Continue to Trust in the healing power and you, in your own time, will regain your non-lump self again. Loving you and Loving God.